The soundcheck. Two new songs that sound through the empty hall of Zenith, the Swedish one, we´re gonna hear that night again. Seeing them at the soundcheck first, before the actual gig, is strange feeling. And I could be there forever. It´s much more real that the concert itself. It´s somehow raw. It´s somehow human. It´s like watching YouTube video, however I´m truly inside. One of my silly dreams is becoming true. The soundcheck last longer that it´s usual and I´m enjoying every second of it. Nevertheless, we have to leave. VIP Backstage Tour with HQ Katrine is wating for us. We´re almost running up to the stairs, to their secret place. There we meet Carlos, watch their dressing room, catering... little escape to Mando Diao world. Then frozen tour bus. Maybe little bit in a hurry, but it was worth it. Definitely. Wating for the concert is very pleasant this time. Me and my friends have an early entrance that allowed us (almost the whole Prague special Unit) to stand in the first row without fight. 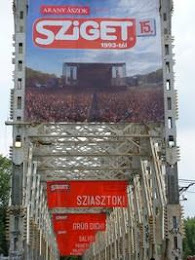 We´re holding our huge czech flag during the concert, five freaks in Munich. Then Daniel comes and it´s Dalarna again that fills the air. Welcome Home Luc Robitaille in special version. Its rehearsal we´ve been watching just few hours ago. This time is for real. 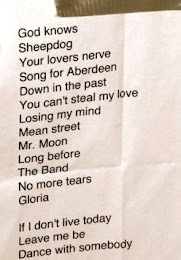 High Heels, Song For Aberdeen, All My Senses, Long Before Rock´n´roll.... Your Lovers Nerve - Gustaf didn´t forget to mention that it´s this song that it´s his absolute favourite...and Dance With Somebody till the end as always. Longer than ever before. What remains is One Heart, One Blood, One Soul. 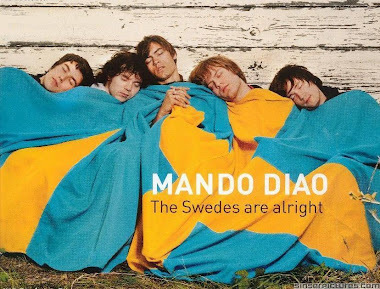 And Mando Diao...., Carlos is right, you are the best band in the world, no doubt about it. Whatever might other people say. Thank you for this wonderful, completely different experience. I will never forget.